PLEASE NOTE: Peter became a widower in December of 2012 with the passing of his beloved wife, Mary Ann, from complications of breast cancer. Throughout their marriage, they expressed their love for each other in many ways. This page will remain during 2013 as a tribute and expression of Peter's love for Mary Ann. Peter continues to present shows as a solo performer. 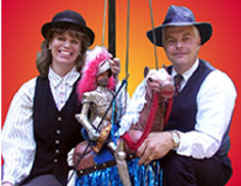 Peter and Mary Ann Hart make up the dynamic team of Atlanta Puppet. During their 16 year partnership together, they have both been listed as Approved Artists and their puppet programs have been approved by by the Georgia Arts Council, the Atlanta Bureau of Cultural Affairs,The South Carolina Arts Commission, and Young Audiences of Atlanta, Inc.